Resident Evil 5: Gold Edition is giving us some pretty snazzy content to go with it. Where did all this content come from merely a year after the full games release? Well, the games director has a bit to say about the "Lost in Nightmares" chapter. 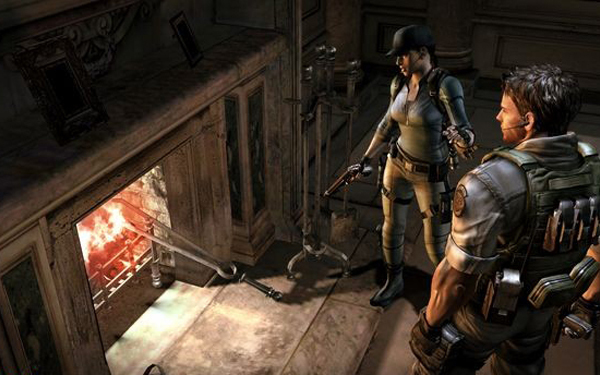 "Lost in Nightmares" is the content that fills in the story when Chris and Jill confront Wesker in the mansion. The Directors Blog has some details about where this "deleted scene" came from, and how they fit it in with the Gold content. First, this chapter of the game was cut out after they added the co-op. A lot of the team wanted to play as Jill - but the development team thought it was too unnatural to switch from Sheva to Jill as the playable second character. The chapter was reviewed and removed in favor of the huge overhaul to add co-op to the story. Once they started playing with the idea of new episodes for Resident Evil 5: Gold Edition, the team (which consists of quite a few "fans" of Jill) thought it was "a natural process" to utilize the new episodes to include this part of the game once more.